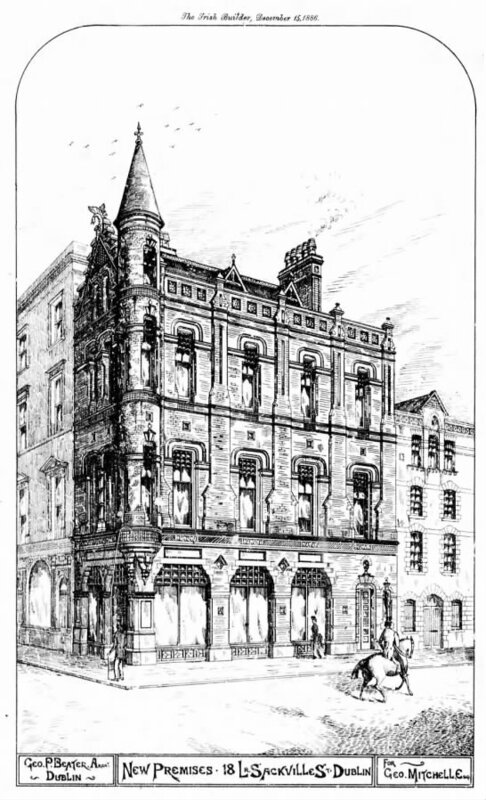 The Irish Builder included the plans for the building at 18 Lr Sackville St in its Dec 1886 issue. The building, which had been recently completed by J. and W. Beckett, was designed by George P. Beater, an architect and illustrator of the sketch shown. The materials included red brick and terra cotta from North Wales and limestone from the quarries of Walter Doolin, Ballinasloe. The ceiling of the shop was finished in pitch pine and American walnut. The shop was for George Mitchell, Esq, but perhaps Mitchell leased it out, for in 1901, the Lambe family lived at No. 18. John Joseph Lambe was a draper. The Irish Builder article mentions that as well as the Imperial Hotel on one side, the premises of “the old-established drug and window-glass warehouses of Messrs. Hoyte and sons.” By 1901, a new chemist was resident in No. 17: James Campbell from Co. Down. The article mentions that Sackville Place was formerly known as Tucker’s Row, and indeed on Rocque’s 1756 map, Tucker’s Row is marked. 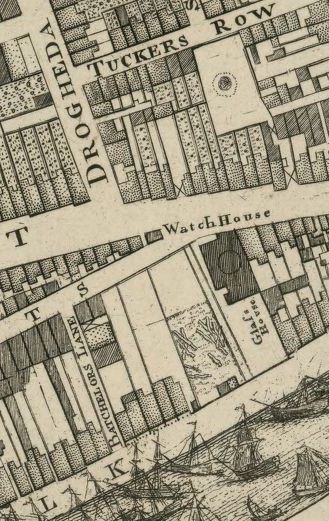 Of course at that stage, there was no bridge over the Liffey between what became O’Connell St and Westmoreland St., and the stretch from Tucker’s Row to the river was called Drogheda St.